It recently was revealed that Republican Florida gubernatorial hopeful Ron DeSantis spoke four times at the David Horowitz Freedom Center, an Islamophobic institution for Zionism in America, founded in 1988 and formerly known as the Center for the Study of Popular Culture. Their name change leads to the obvious question: why do these groups keep changing them? Ron DeSantis has no comment on the matter. What looked like a Republican hopeful, with Donald Trump’s solid gold endorsement to take the governor’s seat in Tallahassee, has turned into a campaign of self-inflicted wounds for Ron DeSantis. It happened from the start, after easily winning the primary over heavily-endorsed establishment Republican Adam Putnam. It was then that DeSantis told the voters of Florida not to “monkey up” this important election. That’s been played in Democratic attack ads & media pieces ever since, and will be until Gillum’s victory on November 6th. In-your-face, overt racism will mobilize black voters. That’s a political tip for Republican strategists who don’t get it. Black & Hispanic voters are THE key racial demographics in this race, and Andrew Gillum is the African-American mayor of Tallahassee. He is seen in the media as more “folksy,” which is nice during an election, and appears to have more energized supporters with the better “ground game.” The latest Rasmussen Reports poll conducted on 9-10/9-11, have Gillum at +6, with a 3.5% margin-of-error, which puts a black Democrat in the Florida governor’s mansion. That’s a potential political bombshell just seven week out. Florida has been consolidated top-to-bottom under Republican-controlled machinery since 1998. It was governor (and brother) Jeb Bush, along with Republican Secretary of State Katherine Harris who delayed the final counting of votes during Election 2000. Bush/Cheney were in sync with the Republican machinery that controlled the electronic voting machines and paper ballots. The right-wing US Supreme Court was eventually maneuvered to intercede, and declared the election certified with the remaining uncounted votes not needing to be counted. The rationale was that the Electoral College decides the US Presidency, therefore there is no right to vote, and thus no need to count all the ballots. Case closed: Bush v Gore 2000. This machinery also locked up Florida in 2004, in the Bush/Cheney squeaker to outdistance the blah Democratic ticket of John Kerry/John Edwards. It came down to manipulation in Ohio that cycle, but Florida was also highly-fudged and possibly tipped to the Republicans. The point is Florida is always in play, and is a bellwether for US Presidential elections. That makes the Andrew Gillum campaign of more-than-passing interest to astute political observers of all parties. Trump won Florida, Michigan & Pennsylvania in Election 2016. If Hillary Clinton had won one of those states, she would be US President. Of those three battleground states, Michigan is the one Democrats must hold, otherwise they lose. Hillary Clinton’s reactionary feminism and identity politics campaign came off as too phony to too many voters dealing with mass poverty, industrial blight, and infrastructure collapse (Flint water) that Democrats have ignored on their watch for too long. That’s why she lost, when it was all handed to her, and the Democrats are still pretty upset about it in case you haven’t noticed. People don’t get energized by Democratic party rhetoric anymore, because it’s been revealed in countless ways to be lies & hype. With that said, Trump is widely perceived as worse, so he can’t expect to win Michigan again in 2020. Pennsylvania is the swing state of the three in play here, in that the Keystone State can go either way, and in that sense it is the decider of the Electoral College if everyone else holds. Florida is a must-hold for Republicans and Trump 2020. The kicker is that Trump probably can’t win Florida without the Republican state machinery fully backing him. Those are the stakes here, and it has nothing to do with ideology– it’s pure power politics, which means reaction all down the line– unless the working masses intervene. In comparison, the Senate race between Democratic incumbent Bill Nelson and term-limited Republican governor Rick Scott (+1.6%) is a sideshow. 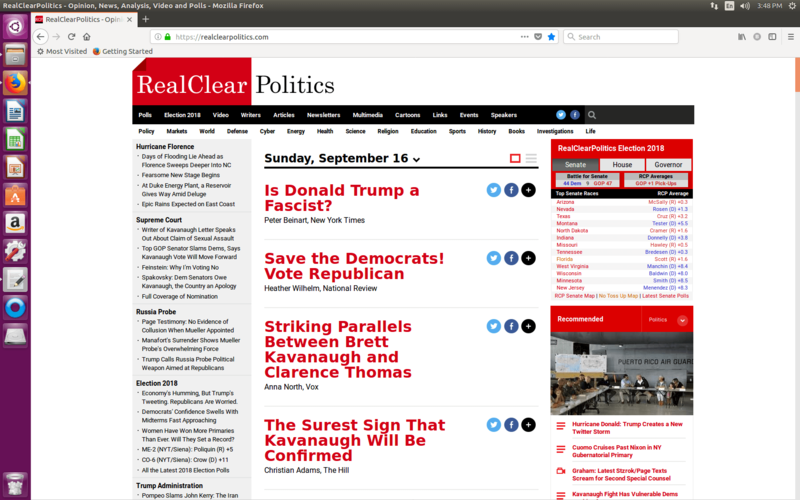 We’re talking about a hotly contested, heavyweight political race in a key swing state, with the context being a current Republican 51-49 majority in the US Senate up-for-grabs, and it’s second fiddle to a local-yokel governor’s race, which is seen by many analysts & insiders as decisively influencing the 2020 Presidential election. Trump can lose 2020 here in 2018, and his team knows it. That’s why they are upping the fear factor and bullying aggression, which has no other logic except this. This is high-stakes politics and Ron DeSantis (above, right) isn’t up for it. He has looked like a clown repeatedly, and unless there is a major “gaffe” or scandalous revelation from Andrew Gillum, the Tallahassee mayor should win comfortably– as his lead is already beyond the margin-of-error and increasing. There are still plenty of good ol’ boys who think they should decide everything, and billionaire Ron DeSantis is one of them, but they are no longer the majority. 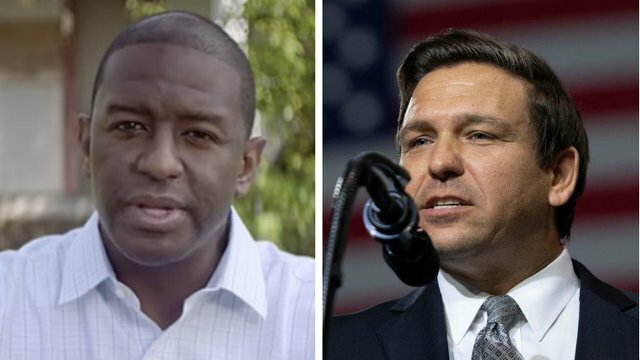 In what was seen as a highly-unusual political move (even by Florida standards), DeSantis ceded his incumbent congressional seat on Monday September 10, to “focus exclusively on the gubernatorial race.” The way the political winds have been blowing recently, I get a sense that Ron DeSantis would have a hard time holding his congressional seat against any significant Democratic challenger. DeSantis doesn’t have any real Republican support in Florida that is helpful. 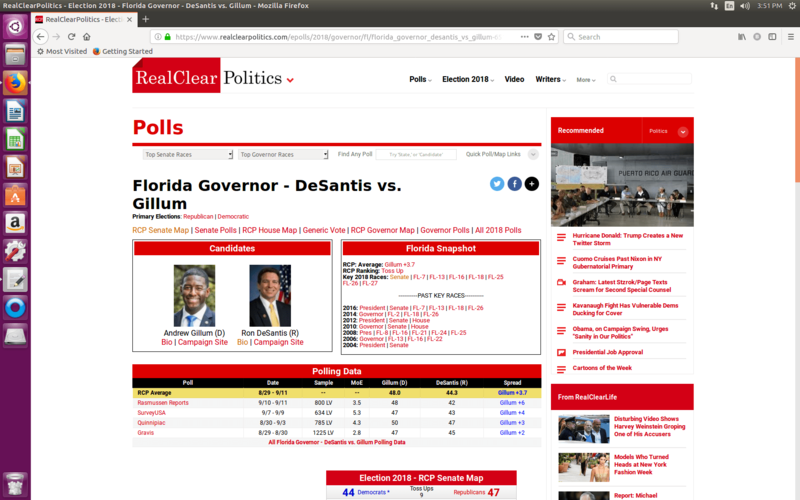 Adam Putnam would have at least given Gillum a better run, and possibly been able to steal it for the GOP. DeSantis’ campaign has no specifics on anything, little local support, and is overtly racist– making him DOA. Trump picked him, so he deserves to lose in 2020 (if we get that far) for his low-IQ decision to endorse Ron DeSantis over someone who had actual political clout in Florida. It’s just another example of Donald Trump’s ego in self-destruct mode, and it’s why Republicans are so divided over him. Yes, there is still good ol’ boy resentment over losing the American Civil War (1861-65), and it doesn’t respect Yankee authority– especially when it’s been exposed as hypocrisy. These are your Bible thumpers, n-th generation rednecks, and conservative “snowbird” retirees who have lived here forever and run all the local governments, police and public utilities– and they are nearly all Republicans. This is not going to be a peaceful co-existence if/when leftist-posturing Democrat Andrew Gillum wins the governor’s mansion. This political intrigue & social powder keg in Florida is a perfect microcosm of the US political economy. High Times & Tides: Marijuana legalization is a political issue in Florida, and it became a police issue in Ormond Beach in the days preceding the passage of Hurricane Florence, as surfers spotted square groupers (above) among the waves. 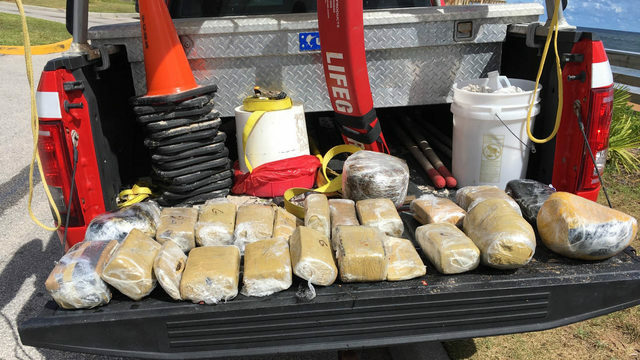 Local authorities seized the bales of cannabis in plastic wrap, and speculated it came from a drug boat that got caught in the storm and had to dump cargo.